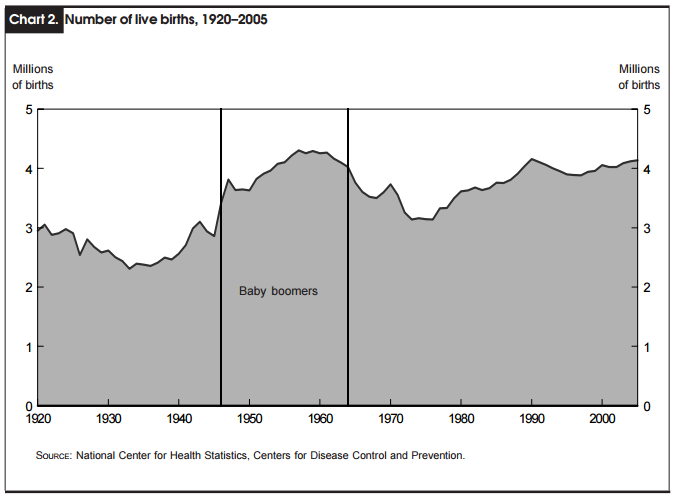 The aging of the Baby Boomers is not something that caught economists completely by surprise. That generation has been the subject of (academic) study going back to the surge in birth rates right after World War II. In economic terms, the challenges presented by the prospective retirement years for this cohort has been anticipated to some degree all along, particularly as the 20th century from which the demographics were born ended. With an annual growth rate of 0.6 percent over the 2005–50 period, the labor force is projected to reach 194.8 million in 2050. Peaking at 2.6 percent during the 1970s, the growth rate of the labor force has been decreasing with the passage of each decade and is expected to continue to do so in the future. 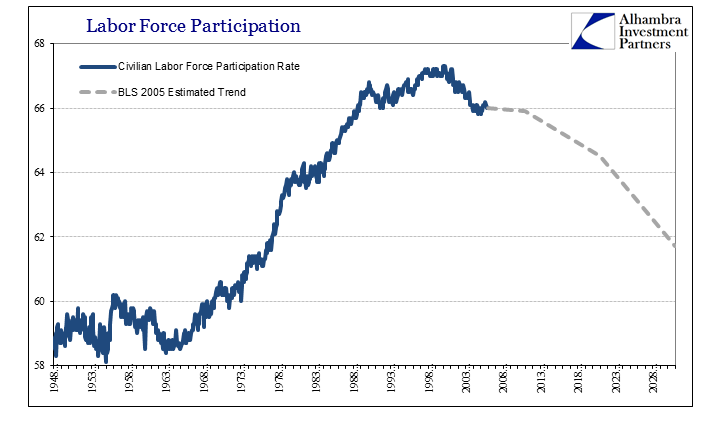 Using various statistical and regression-based models, the BLS figured that the Civilian Labor Force Participation rate would decline to 65.9% by 2010 from 66.0% at that time in 2005. 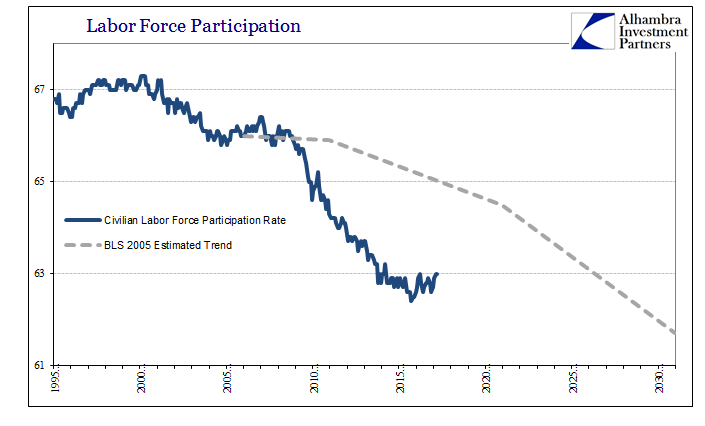 By 2020, the participation rate would be 64.5% and ten years later just 61.7% as the bulk of the demographic retirement would have by then transpired. There were considerable uncertainties and qualifications to these predictions, of course, as there always are trying to predict so far into the future (and using extrapolations of the past as the primary guide). Among them, the BLS listed immigration, further gains in the participation rate of women, or the young (it was the housing boom, after all, and construction work was plentiful at the time), but also the prospect of seniors themselves working longer. What wasn’t included as a possible trend-changer was a massive economic collapse caused by systemic monetary rejection that contrary to the very nature of recession meant a permanent alteration in the global economic system. In the years since the Great “Recession”, economists and policymakers have feverishly tried to reconcile this difference. This is not to say that the BLS’ 2005 projections are the correct starting point for estimation, but they were much closer to consensus pre-crisis, an estimation that lasted several years into the “recovery.” It is the lack of it in the labor force that has gained so much notice and led to an enormous divergence about what it could possibly mean. If the gray dotted line above should have been closer to the actual track of the participation rate to more accurately reflect demographic changes, then there would have been no use at all for any but the first and maybe second QE (according to orthodox understanding; in reality, there was never much use for QE in any context). Disclosure: This material has been distributed fo or informational purposes only. It is the opinion of the author and should not be considered as investment advice or a recommendation of any particular security, strategy, or investment product. Investments involve risk and you can lose money. Past investing and economic performance is not indicative of future performance. Alhambra Investment Partners, LLC expressly disclaims all liability in respect to actions taken based on all of the information in this writing. If an investor does not understand the risks associated with certain securities, he/she should seek the advice of an independent adviser.